Do you want ALL of the Bonuses? For the price of a coffee per day, you can receive all of this! Toolkit For Your Wealth Creation ($300 value! 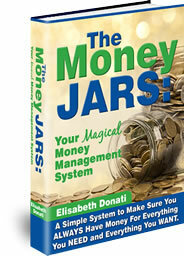 “Money Jars” ebook by Elisabeth Donati. Would you like a simple tool that is guaranteed to help you out of your financial problems, slowly but surely, IF you apply the principles and follow the directions every single month? The Money Jars are your answer! Upgrade now to become and exclusive VIP for only $47!